…and Why Kitsap May Not. But seriously, there are some clues that hint at a very interesting fall and winter season around here. Personally, I’m not seeing an exlusively “cold” winter per se, but I believe there will be moments this winter that will impress even the biggest of weather enthusiasts. Today I’d like to talk a little bit about the PDO, or the Pacific Decadal Oscillation. “The Pacific Deca-whaaa? ?” It’s OK…I can’t even say it right. But the PDO plays a big part in our weather around here, especially in the wintertime. 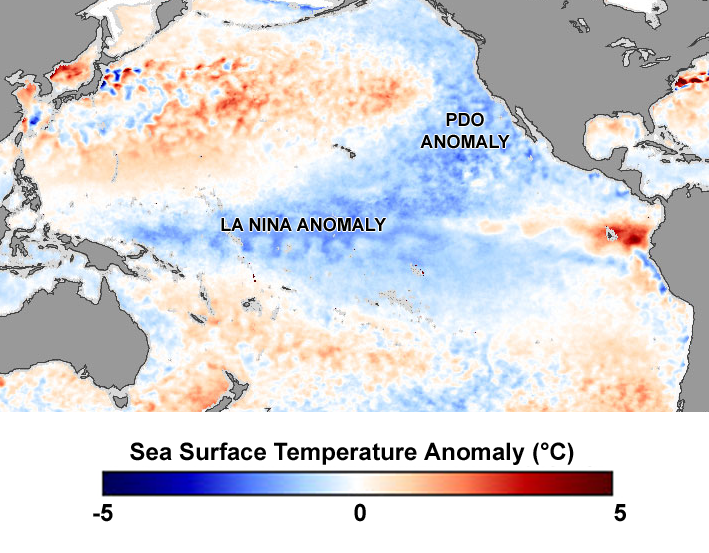 The definition of the PDO is, put in my own words, an El Nino-like pattern that changes in variability every 20-30 years in the North Pacific Ocean. Don’t confuse the word “El Nino-like” with “being exclusively like El Nino”. You know how we go from La Nina to El Nino and vice versa every few years? The PDO works like that. It goes through warm and cool phases, except it is centered in the North Pacific (see image at the top of this post) and affects us directly. Look closely at the above graph. I know it’s a bit blurry, but you should be able to make out the general trend. Notice from about 1945 to 1979 or so the big jagged period of prologned blue blobs. That signifies a roughly 30 year period of a negative phase of the PDO. During that time, the Northwest experienced some of the harshest, snowiest and coldest winters on record. We can use 1950 and 1968 as examples. Then from about 1980 to about 2004 we entered a strong positive phase of the PDO. This resulted in warmer winters, some of which were VERY warm. Take 1998 for example or 2002. While the rest of the country may have been cold during these years, we were “baking”. This is why I feel the Pacific Northwest may be in for some pretty rough, cold and stormy winters ahead. Weather does indeed happen in cycles, and it appears it is restarting a cycle from 60 years ago. If that’s true, we could experience active winters until the 2030s. Right now this is pretty much speculation, but I’m just sayin’, as the good Eagle Scout I am: Be Prepared! BUT, we must remember, this year is an El Nino year and while 2006 and 1968 were both FANTASTIC winters despite the El Nino, we are certainly due for a warmer than normal winter. We’ll shall see!